A tasting note about a 22 years old PX cask aged GlenDronach has been mentioned in previous article, yet another PX GlenDronach but must younger is here. This whisky is exclusively bottled for a landmark whisky activity in Europe, The Whisky Fair 2013 held in Limbury of Germany. Worthy to take few drams. Conclusion: Sweet nose, mainly the dried and preserved fruits, little bit alcohol burnt, hint if spicy.Strong body, rich chocolate, toasty and little bit hot spicy.Medium length aftertaste, mild bitter grounded coffee, very good. 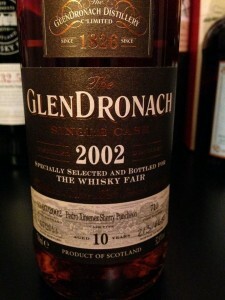 This whisky tasted somehow immature and not complex but the overall portfolio is OK, clean and straight forward. In fact this whisky is fairly good to a just 10 years old high proof single cask whisky.